On 24 May, 2018, 15 pro-democracy activists who participated in a public assembly and procession during 21-22 May were brought before a Court after being detained in police custody for two nights. The activists and others of the ‘We Want to Vote Movement’ have been demanding the government to hold elections within this year. 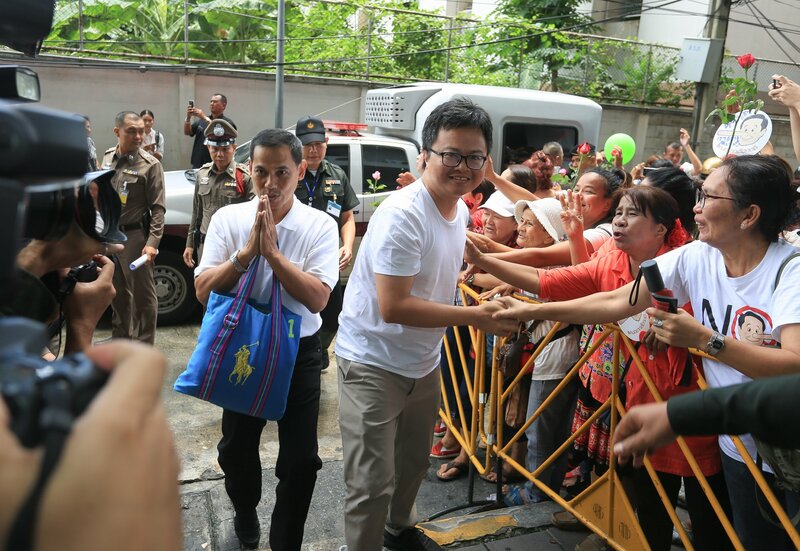 At the Bangkok Criminal Court on Ratchadaphisek Road, the inquiry officials seeked a permission from the Court to have the fifteen suspects in further pre-trial detention. The 15 activists could be divided into two groups; ten of them held in custody at the Phaya Thai Police Station and five at the Chana Songkhram Police Station. The 15 activists include Anon Numpa, Chonthicha Jangrew, Nuttaa Mahattana. Ekachai Hongkangwan, Chokchai Paiboonratchata, Kiri Khanthong, Putthaising Pimchan, Wiroj Trong-ngarmrak and two others who want to remain anonymous whereas the other five were detained at the Din Daeng Police Station including Rangsiman Rome, Sirawith Seritiwat, Piyarat Chongthep Viset Sangkhavisit, and Nikorn Wittayaphan. According to Khaosod Online, at 8.30 am on 24 May, Pol Gen Srivara Ransibrahmanakul, Deputy National Police Chief, has gone to the Chana Songkhram Police Station to review inquiry reports in the cases against the 15 pro-democracy activists after the cases had been reported by the NCPO on 21 May 2018 and prior to the 48 hours of police custody. The police general pressed for more inquiry on certain issues claiming 80 entrepreneurs in tourism industry had reported a case at the Nang Loeng Police Station and submitted a letter of petition to the Ministry of Tourism and Sports claiming they had been affected by the public assembly, as there has been a decrease in the number of tourists, as they had become concerned and decided against vacationing in Thailand. In addition, ten police officials have got injured from the event. As a result, the police have asked Rector of Thammasat University urging her to report the case against the pro-democracy activists just being brought to the Court, but the university has declared they would not report such case. 12.10, ten alleged offenders held in custody at the Phaya Thai Police Station were brought to the Bangkok Criminal Court for remand hearing. 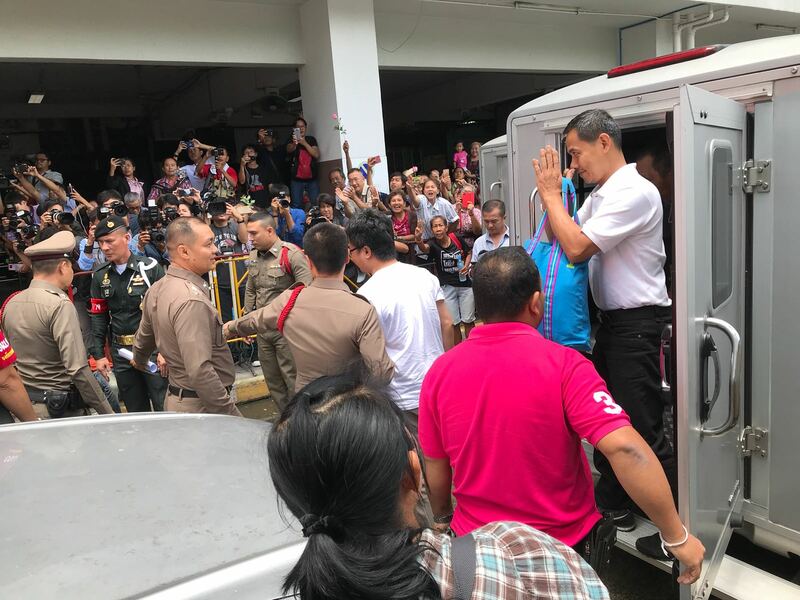 12.30, fifteen alleged offenders held in custody at the Phaya Thai Police Station and Din Daeng Police Station successively arrived at the Bangkok Criminal Court and the inquiry officials have pleaded to the Court to have them remanded in custody. During that time, the alleged offenders had a chance to get off the car to greet people who came to give them moral support before entering a pre-hearing meeting room. 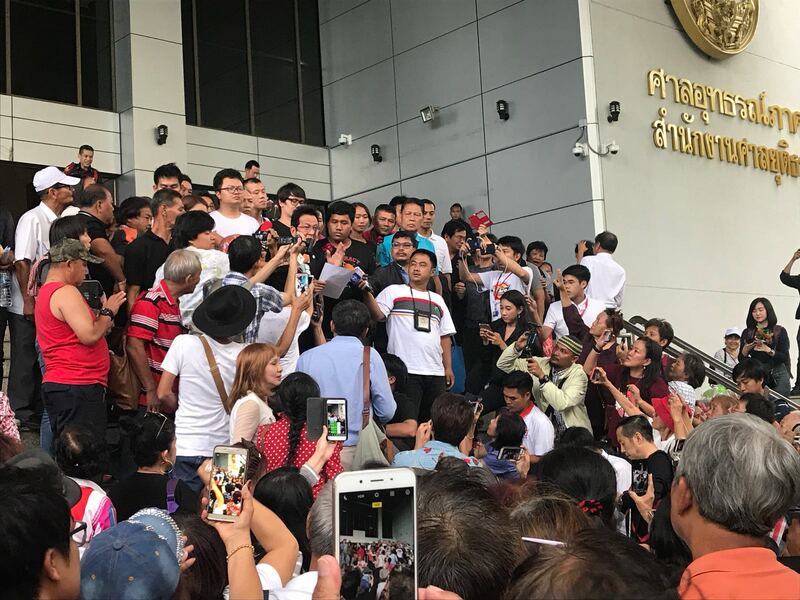 12.40, the alleged offenders entered into a detention room at the Bangkok Criminal Court and the inquiry officials have pleaded to the Court to have fifteen of them remanded in custody. 14.45, Pol Col Ratchaphon Chanasrikhajon, Head of the inquiry team and Pol Lt Col Prajak Pong Preecha, Deputy Superintendent (investigation) of Chana Songkhram Police Station entered the pre-hearing meeting room. 14.56, defense attorneys entered the pre-hearing meeting room awaiting the order of the Court. – The alleged offenders have exercised their right to freedom of peaceful assembly which has taken place peacefully and unarmed. Such right is guaranteed by the Constitution. The public assembly has neither led to a breach of peace nor caused damage to property or life of any person. The alleged public assembly did not constitute a harmful event. In addition, the alleged offenders neither have any influence nor capacity to tamper with evidence. Also, these cases are involved with a public assembly and evidence of the case including still pictures and videos documenting the event have already been held in possession by the inquiry officials. Therefore, the release of alleged offenders shall not pose an obstacle to and compromise the ongoing investigation of the inquiry officials. – The alleged offenders have permanent addresses and have shown no intention to abscond. The interviews of alleged offenders by the inquiry officials have been completed. Having them remanded would just cause to much a burden for the alleged offenders and would interrupt their study. It will greatly impair their rights and freedoms to prepare their own defense. –An offence against the Head of the NCPO Order no. 3/2558 (2015) is a politically motivated one. It is an offence per the Head of the NCPO Order no. 3/2558 (2015)’s Article 12 which states that “five persons and upward being illegally assembled or being assembled for political purpose”. The Order has been decreed by the National Council for Peace and Order after they had seized ruling power. They have issued such Order unilaterally without public consultation. – The exercise of the right to freedom of peaceful assembly is a tool for citizens, who share ideologies or goals and have decided to gather among themselves, to express their opinions freely. It is an expression of determination of the people to whom sovereign power belongs. They simply want to remind the “government”, regardless if they are an elected one or a self-proclaimed one established by the virtue of a coup. – The country is currently subject to an abnormal rule as governance has been carried out at the behest of people with draconian power obtained through a coup and thereby public administration has been rendered unchecked and unaccountable, unlike in a democracy. 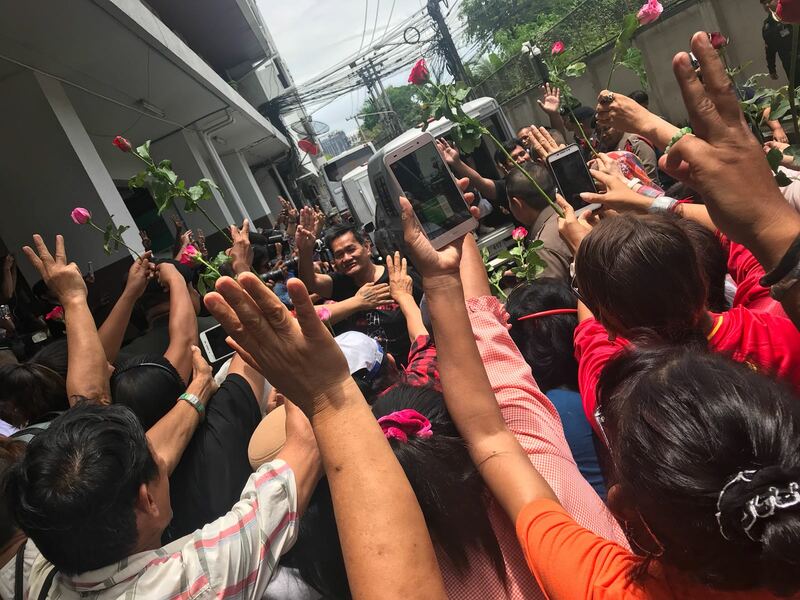 15.20, the Criminal Court dismissed the alleged offenders’ motion against further remand in custody without hearing the objection and granted a 12-day further pre-trial detention of the fifteen activists as requested by the police. When the inquiry officials requested for a further remand in custody, the judge commenced the hearing without inquiring the alleged offenders if they objected the request for further remand. One of the alleged offenders, Anon Numpa, pleaded to the Court that he objected the request for remand, but the judge simply responded by saying it was now too late and suggested that the right to bail or the right to appeal the court’s order be exercised instead. According to the court docket, after reviewing the case, the judge deems that the fifteen alleged offenders have been placed under arrest and pressed with charges by the police and they can prove their innocence during the trial. Since the police investigation has not been completed, it is reasonable for the officials to request for a further remand in custody and the Court thereby grants the request. Then, attorneys and bondsperson of the alleged offenders applied for bail of the fifteen alleged offenders placing cash bond worth 100,000 baht (approx. 3120USD) for each one of them. The Court imposed a condition on all of them to refrain from participating in any political gathering which violates a law and causes danger to public. Another condition was set forth by the Court exclusively on Nuttaa Mahattana, in addition to barring her from participating in any political assembly while bailout, that “more cash bond could be further requested, should they be pressed with more charges”.